A face can fake a thousand smiles, but a thousand faces hide nothing. Today I saw a thousand smiles on a thousand faces of Iraqis who were unable to contain their joy and pride. The act of voting spread elation through the crowds the way the sounds of explosions have so often spread fear and despair. Today, I witnessed history of global proportions unfold in the small country of Iraq. Knowing the magnitude of this event, I wanted to witness it from the most important perspectives, and to meet the people who were taking part. My election day began in the US military headquarters, then shifted to American and Iraqi soldiers on the ground. Next, at the JCC (Joint Communications Center) that would oversee the elections for Diyala Province; and finally, where votes were being cast. At the US Army Tactical Operations Center (TOC) FOB Gabe, Baquba, election day began with thuds, booms and gunfire. By 0032 hours, the board in the TOC listed eight roadside bombs in Baquba, and the radio crackled continuously with reports of US forces encountering small-arms fire. Two minutes later, at 0034, a US patrol in Baquba hit a roadside bomb. No one was injured and the soldiers continued the mission. The pace only quickened. Reports of enemy contact poured in. At 0105, a patrol encountered heavy gunfire and mortar attack. Four minutes later, Lt. Colonel Bullimore, commander of operations on FOB Gabe, walked into the TOC. Sergeants and officers in the TOC introduced Bullimore to the battlefield with a SITREP (situation report). Four minutes later, at 0113, more reports of explosions and gunfire. Two minutes later, at 0115, the voice of a US soldier issued from one of the radios, casually describing more enemy contact. Simultaneously a memo appeared on the secret prompter that a polling site was, "reporting intense fire." A minute later, the same prompter scrolled that two Kiowa helicopters were inbound. Meanwhile, a television screen showed a live civilian broadcast that Iraqis in 14 other countries had begun voting. The briefing over, LTC Bullimore headed to the JCC in downtown Baquba. I journeyed in his vehicle. The soldiers believed that the JCC would be attacked today. We arrived at the JCC where Iraqi and American officials were engaged in last-minute efforts to ensure polling sites opened on time. The insurgents were already doing their best--with bombs, mortars and machine guns--to make sure those polls stay closed. Yet by 0700, most of the polls had opened and voters tentatively began to turn out. Reports of gunfire and bombs continued streaming in, but as the hours inched by, reports of heavy voter turnout also increased. There was a live feed from downtown Baquba by an enthusiastic CNN correspondent. Iraqi voters were not only coming to the polls, but were so exuberant once there, that their excitement drowned out the correspondent. By noon, it was obvious that the terrorists would not own this day. But terrorists were clearly making the effort, killing voters around Iraq. Yet more voters continued to turn out. Lines were forming at some polls. A US patrol in the Buhriz area of Baquba came under small-arms and RPG attack. The reinforced "Punisher" platoon, led by Lieutenant TJ Grider, consisted of three Bradley fighting vehicles and six Humvees. Punisher had been moving to the Buhriz area, where insurgents were attacking the polling station, successfully preventing voting. American units had been instructed to minimize combat to avoid frightening voters. But since nobody was voting at that station due to the ongoing attacks, Lt. Grider said that the commander of Coalition forces in this area, Colonel Pittard, gave him clear instructions: "If they aren't going to vote anyway, we might as well kill some bad guys." Punisher was told to kill people who were preventing voting. And the people who were preventing voting started trying to kill Punisher platoon. First came three RPGs, then two more. But Punisher was moving in and swept up through the area, surprising two men who held AKs and had RPGs propped up against a wall. The Humvee gunner killed them. A Bradley vehicle on the next road reported killing three more, then blew up two cars, which were not supposed to be there. There was heavy shooting during which an American was slightly wounded, but soon returned to duty. The polling station was closed down and moved to another area of Baquba, where voters soon arrived. I wanted to see the voting hand, so I hitched on the first convoy I could get, which happened to be taking that same CNN crew to another dangerous polling site in Baquba. In fact, of the 40 polling sites in Baquba, some US soldiers were wagering this one was most likely to be bombed. The CNN crew had only three people, including the correspondent. They were to be dropped off and left at the polling station. I stayed with them. 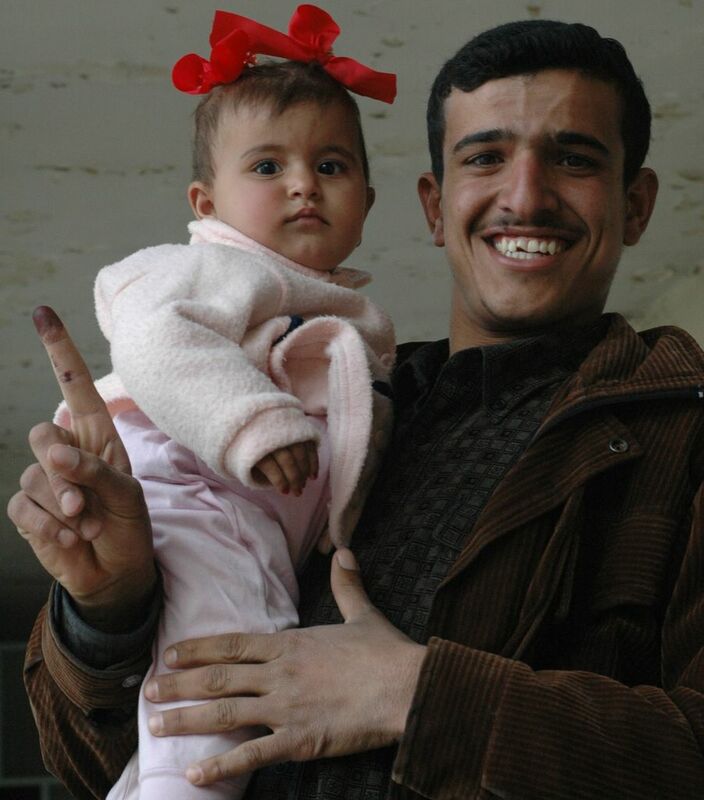 The American Army was not permitted to be stationed at the polling site; this was to be an Iraqi vote. So, the soldiers left us behind in the same neighborhood where I had been accompanying the Army on raids just a week earlier. An hour passed while voters stretched out in a line perhaps thirty yards long. A second hour passed, and the line remained steady. No bombs, no RPG attacks. But if there were to be any attacks, they might come at the end of the day, to destroy the ballots. The terrorists knew that to destroy ballots was to destroy the elections. Yet the voters were exuberant, as if there was no possibility of attack. I spoke with many people--Sunnis, Shias, Christians, and others were standing in the same lines. Three police officers handcuffed a large man. They escorted him with great purpose to an abandoned room of the school. I approached to see what was happening. Did he have a bomb? The policemen, who had been asking me to photograph them for the last hour or two, suddenly told me to stop taking pictures. Naturally, this caused me to pick up the camera and take pictures. "What did this man do?" I asked an Iraqi official. "He was, let's say, misbehaving." Misbehaving? I hadn’t heard any bombs or gunfire at the polling station (not in the polling station, anyway), nor any commotion. What had he done? The official would not tell me. "Is he a terrorist?" I asked. "Why did you arrest him?" "Not important, really not important." "You have arrested a man who came to vote. This is very important. Why have you arrested him?" Finally, the official embarrassingly explained that the man had grabbed the backside of the woman producer for CNN. I sensed that he did not want a writer to know what this Iraqi man had done. "What will you do with him?" "He will spend two weeks in jail." "For grabbing the woman, yes." Eventually, the police conversed with the CNN crew, and released the man. Meanwhile, more than a thousand Iraqis had come into the polling center. Men and women, old and young. There were religious leaders and attorneys, police and children. And every single person seemed to smile and give the thumbs-up. "From what country are you?" I heard this dozens of times. "Ameriki," I would say with a smile. "Ameriki, yes!" was a typical thumbs-up response, accompanied by sincere smiles. Even some of the women, a couple of whom were old and could barely walk, actually gave the thumbs-up. As the polls began to close at 1700 Baquba time, last-minute voters ran in breathlessly and smiling. Their votes were cast and the polls closed. More than 1,400 people had voted at this site, and CNN was going live next to the ballot boxes. We had been alone with the Iraqis at the polling station for about three hours when the American soldiers came to pick us up. Seeing the American soldiers move through the school was a happy relief; this was a very dangerous neighborhood. The people had been friendly, but I did not like being there on election day without American military nearby. The CNN crew was having technical problems with the broadcast. The American soldiers were trying to hurry them; the sun was setting and gunfire was increasing. About two minutes after we drove away, tracers began zipping nearby. We pulled into the JCC just as a firefight erupted. I took the stairs to the roof and watched as our troops began firing into the neighborhood we had just come from. Tracers flew by the JCC roof. There was machine-gun fire down in the neighborhood; American forces were firing machine guns and rifles at suspected targets. Explosions. The polls had closed and the ballots were now critical. Losing the ballots meant losing the elections. The ballot boxes were still out there. "Cobra Six reports polling station tango hotel zero two has been vacated by the IPS along...they took uh, the ballot boxes. They may be moving to Al Sharkeys." A soldier holding a cooling rifle on the wall said, "An' that's just about where that friggin' firefight's goin' on, right sir?" Radio call: "TOC, this is Thunder one two delta." "Roger. South gate all secure at this time." "This is Three, bring your QRF [Quick Reaction Force] to redcon one, minus the FLA. I want you to go over to the museum, the IECI office next to Al Sharkey. I want you to account for the ballots and the ballot boxes that are currently being brought there by the IPs [Iraqi Police] over." "Roger. You want me to do what with them? You want me to get them, over?" "I want you to secure them, so we can get some lift assets there." "Roger on the way. Crow's nest, you heard it. Diggy[? ], let's go." Men began to run from the roof down the stairs. Radio call: "QRF, let me know when you got your engines runnin'." "They're on. They're waiting for you, sir." "We'll be waitin' on you, Sheriff." Laughs over the radio, "You won't be waitin' on me." "Command net, sir, so everybody can battle-track you." The QRF launched from the JCC to secure ballot boxes. Other soldiers came to the roof and began rearranging the weapons systems, re-prepping for battle. A cold wind blew over the roof, dogs began barking, and except for the sporadic battles running across Baquba, life was returning to normal. Another burst of machine-gun fire from an American position. More rifle fire. Radio call: "JCC, you need to tell IPs south gate there's friendlies, they're shootin' towards 'em." More rifle fire. Green star cluster from a palm grove. More machine-gun fire. Tracers. Explosions. Dogs barking. Wind blowing. Moments of silence. Democracy begun. The seeds were in the field, but the crows were out there, trying to pick off the ballot boxes before they could be counted. The drama of the ballot boxes, and the Coalition who made this election happen, will never be fully told. But, one day, when Iraqi children read about their history, the courage of their parents on January 30, 2005 will fill them with awe, and that is enough.